I had an amazing stay at the phanganist hostel. It is super clean with a nice pool. The staff was incredible. Sharon, the owner, is the best. And CK too. Make sure you'll join the day tours they arrange Cause you'll see the most beautiful spots on the island. Koh phangan is so much more than only the full moon parties. So enjoy your stay at phanganist! Absolutely loved my stay at Phanganist! For the people that are complaining that the hostel is located too far out, you need to know that Baan Tai is the area where all the big hostels are located! Perfect spot to start day trips with the scooter from, as the main sights are up north. Thanks to CK for taking me to an amazing view point. Full Moon Party can easily be reached by taxi, you’re all leaving to the partys with all the people from the hostel anyways. Leuk personeel die erg interactief onderneemt, er worden veel activiteiten georganiseerd. Faciliteiten zijn erg goed, andere hostels met dezelfde faciliteiten kosten vaak meer dan het dubbele. Leuke tijd gehad!! Dit hostel was gewoon super. Zo'n toffe staff. Ze doen er alles aan om alleen reizigers zich direct welkom te laten voelen. ' s avonds tijdens beer pong en alle spelletjes doen ze ook actief mee. Super!! 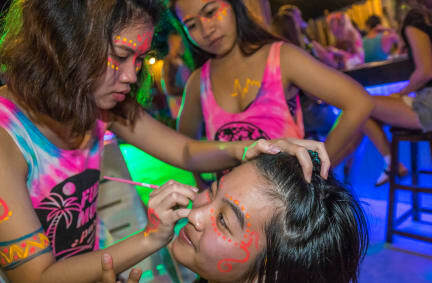 Gezellig hostel waar leuke pre party worden georganiseerd voor de Full Moon Party en alle andere feesten op het eiland. Veel mensen van andere hostels komen hierheen voor de pre parties. Schone fijne kamers, maar het personeel is redelijk bot/onaardig. De locatie op het eiland is oké, maar er is niks op loopafstand.